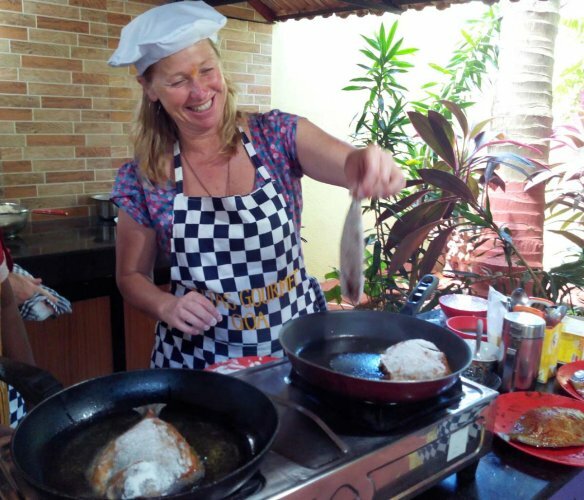 Every traveler looks forward to different experiences/activities during their stay in Goa. 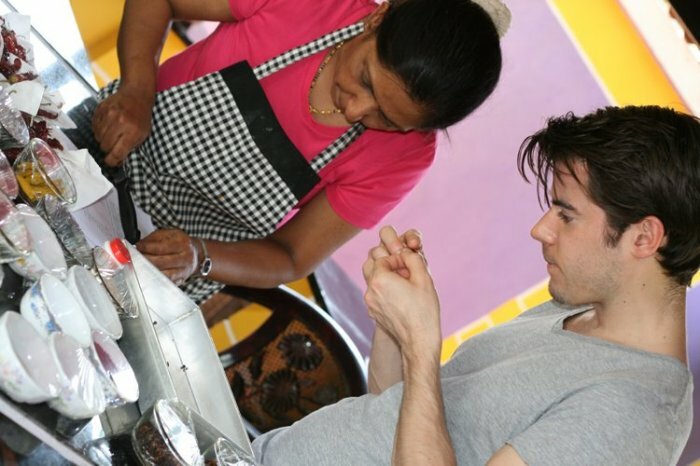 If you are looking forward to learn and watch demonstration cooking activity, then we have for you a five hours ‘Cookery Class And Market Tour Experience’ in the rich and aromatic Indian Cuisine. 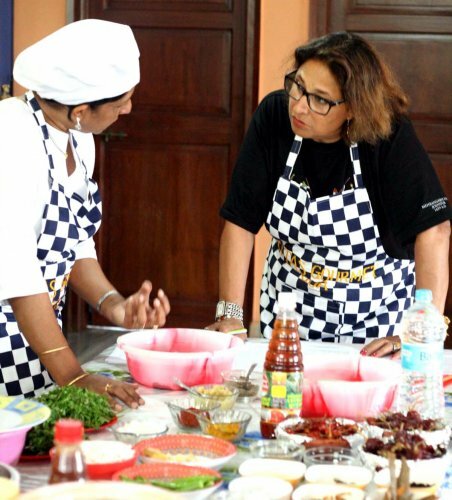 This package comes with an ethnic breakfast, a guided local farmer’s market tour, brief introduction to different spices, masalas, ingredients etc., demonstration cooking class in five classic delicacies and participation in at least two of these dishes followed by a sumptuous lunch. 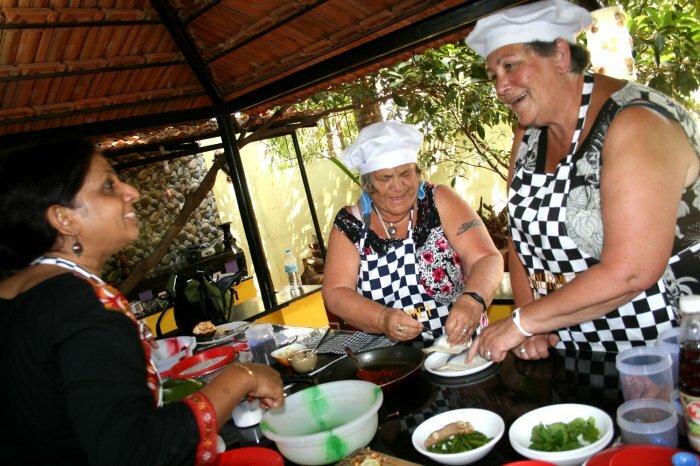 You have all the time to indulge in learning cooking, relishing the dishes, asking questions & clarifying your doubts and having friendly interaction over culinary culture and tradition of Goa. Every preparation is explained meticulously to the travelers in an easy an understanding manner. The day is filled with fun and frolic. There is also a Certificate & an Apron as part of the remembrance. 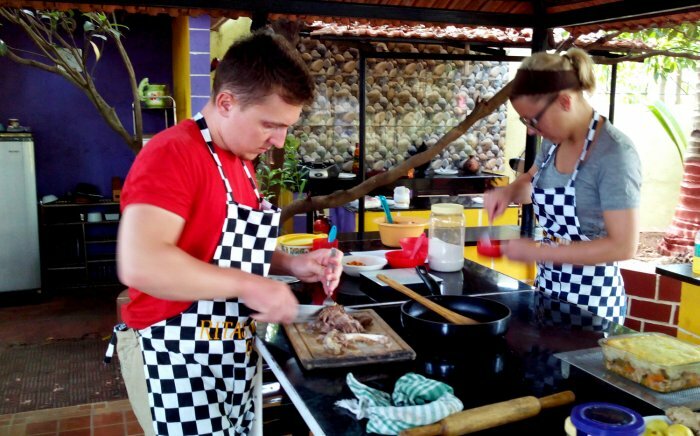 All in all the travelers can look forward to a wonderful and a memorable culinary experience as a day well spent in Goa. 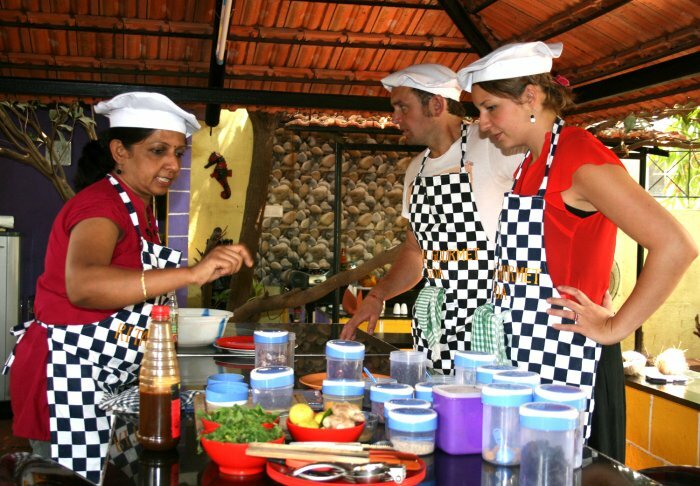 As an option, since Rita’s Gourmet is just five minutes from the Dabolim International Airport, the Cookery Class and Market Tour Experience can also be taken on the day of departure from Goa if the flight departure is any time in late afternoon or evening. The class gets over by 2.30 pm to 3 pm. Mail us and we can assist and try to customize the class timings for you so that you are on time at the Airport. Five dishes generally may include few of the Indian regional along with Goan dishes. We may also pick up some fresh ingredients during the market tour which will form part of the cooking. 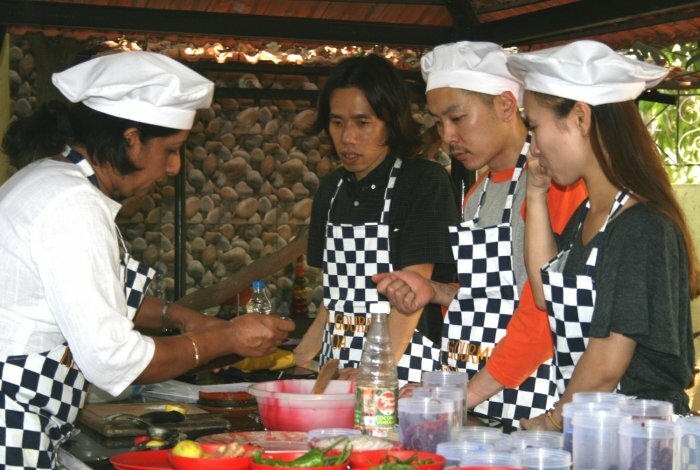 During the booking of the class, one can also express if they have any specific dishes to be learned. Else leave up to us and we will customize a wonderful package for you. Indian Cuisine : Stuffed Parathas, Shahi Paneer, Methi Mutter Malai, Rajma Masala, Chole Masala, Butter Chicken, Roganjosh, Dal Makhani, Jodhpuri Pulao, Malai Kofta, Gajar ka Halwa, Kheer, Phirni, Idli, Dosa, Chutneys etc. Goan Cuisine : Chicken Cafreal, Chicken Xacuti, Prawns Balchao, Mutton Vindalho, Fish Recheado, Vegetable Caldin, Goan Prawns Curry, Rissios de Camarao, Crab Xec Xec, Fish Croquettes, Apa de Camarao, Empade de Carne, Arroz Refagado, Crème Caramel, Seradurra etc. 9.30 am to 10.00 am Arrival of the guests. Welcome with traditional Indian Breakfast & Beverages. Enjoy and be part of preparation of masala chai using flavourful spices such as Cardamom, Ginger, Star Aniseed, Pepper, Clover, Lemon Grass etc. 10.00 am to 11.15 am: Visit the local farmer’s vegetable, fruit, spice market conducted by our tour guide. 11.15 am to 11.30 am: Return back. A brief on spices & ingredients that would be used in the day’s Cuisine. 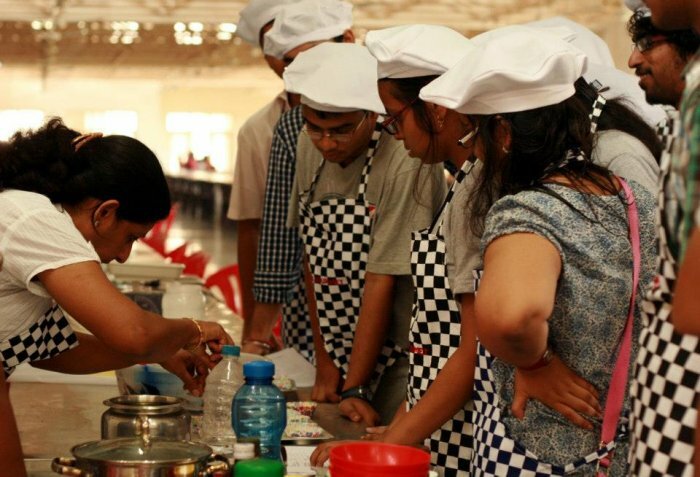 11.30 am to 1.45 pm: Demonstration & Participation Cookery session in five classic dishes. This includes preparation of masalas & chutneys. 1.45 pm to 2.15 pm: Appetiser followed by sumptuous lunch. 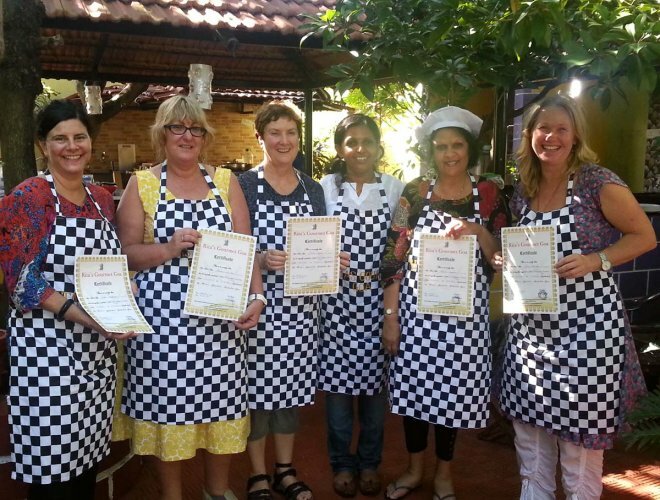 2.15 pm to 2.30 pm: Takeaway Rita’s Gourmet Apron and a Certificate of participation. (Recipe Booklet / Ingredients / Mineral Water will be provided during the class. Clean Wash Room Facility available. Soft copy of the recipe booklet along with pictures taken during the class will be e-mailed). The market tour is conducted if we have three or more bookings on the day. Private class Rates : Rs 4550/- per person. Please mail at ritasgourmetgoa@gmail.com or call Rita’s Gourmet on (+91) 7507452225 to confirm the bookings.